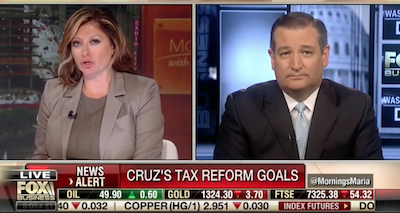 I appeared on Fox Business’ ‘Mornings with Maria’ and Fox News’ ‘Hannity,’ to discuss my priorities for fundamental tax reform. When asked about my objectives on tax reform on ‘Mornings with Maria,’ I discussed the need for tax cuts in addition to major reform. It is important I believe for Congress to pass a tax cut. Not just tax reform. There are some congressional Republicans who want this to be what’s called revenue neutral. Revenue neutral means if you cut taxes here, you jack ‘em up over here so the net is zero. I think that’s a mistake. The case I’m making to the president – the president yesterday said he wanted a big beautiful tax cut – the biggest tax cut ever. I think that’s exactly right. We need to cut taxes on individuals, on families, on small businesses. That’s how we’re going to create jobs. And the only way to do that is to say this is not going to be revenue neutral. This is a tax cut, because our priority is jobs. I then discussed my preference for a single, flat tax. That would be my preference – a single, flat tax that is fair and uniform for everyone. A big standard deduction, and then everyone pays the same simple rate, because I think there’s power in bold simplicity. I think going to the postcard has power, just because it’s small. It means Congress can’t just go and stick a whole bunch of extra garbage on it. It means you have a lot more time in your life, a lot more money in your life to take care of your needs. On ‘Hannity’ I highlighted the importance of full and immediate expensing, for hardworking men and women. Something I called for today is total expensing. Immediate expensing of capital expenditures. What that does is if you’re a farmer, it lets you buy a new tractor. If you’re a steelworker, it lets the company invest in a new steel factory. If you’re a truck driver, it lets you buy a new truck. We care about jobs here in America. Main Street jobs. Manufacturing jobs. Union jobs. Blue collar jobs. Immediate expensing unleashes incredible growth. I think that’s a very important part of tax cuts and tax reforms that we’re pushing forward.